9-year-old Louie was going for a pleasant walk in the local park with his owner and was attacked by two savage dogs. He was pinned to the ground, bitten and was lucky to survive. I'm writing about this healing so many can understand how trauma and grief can affect the cells in bodies, as well as shut down the nervous system, consequently shutting down neuronal pathways in the brain, resulting in illness, anxiety, fatigue for animals and people. As I begin to write, my next door neighbours' dog, which is the same breed as Louie, for the first time walked into my house, approached me gently and put his head on my leg and calmly wandered home. If you believe in how energy can affect you, then you will believe that healing dogs and people by directing energy, (with clear intentions), can be a powerful way to heal diseases, trauma, fear, anxiety as well, helps you have a direct pathway to your own energy and intuition to make the best decisions possible for the best outcome. Louie found his owner to love, be loved and have a life he deserves. He is extremally lucky to be alive. He received stitches to mend his wound but displayed frantic behaviour. Both Louie and his owner needed an energy healing around the trauma of this event. His owner protected him during the attack, took immediate action and made decisions to save Louie. Her adrenal glands, which lie next to the kidneys, help with flight or fight were activated. However, if these adrenal glands are not switched off, the body keeps producing excessive hormones and can result in stress. This can affect a body for years, even generations if these glands are not balanced back to their natural state for effective health. An energy healing to balance all the glands to reduce stress helps the body's natural healing abilities to kick in. Louie settled after I placed my heated right palm on his ear, progressing to his thyroid and finally moving to his heart. He calmed, placed his head on my palm, relaxed by his owners' side and responded to the energy work I was doing to heal his trauma. I then released my palm from Louie and placed on the owners' heart. Louie raised his head and placed his head on the back of my hand, healing his owner from the trauma of the attack. I offered strategies for Louie's owner, to cement the healing for Louie's neurones in his brain after leaving our energy healing session. This being, to walk Louie the same day, to train his brain and body to live without the fear of walking and enjoy walking. "Thank you for seeing us today Trina. Louie is so chilled out, much better, calm & back playing with his doggy friends. We both needed a session with you. 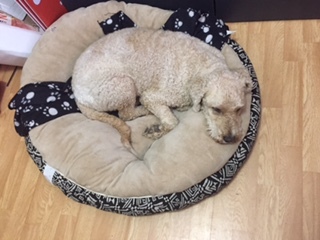 I have never seen him so calm before, and my friend who is a dog trainer was amazed to see Louie so calm and less anxious." I asked Louie's owner to come back in two weeks to heal any slight residue of trauma for Louie after this vicious attack. I gave strategies after the healing to continue the energy work. Life can be busy, but if you place in your mind, that you really want changes to happen, then they do and immediately. For effective fast healing, use the power of intentions combined with energy work & when needed medical attention. It's best to manage frantic energy and stop developing dysfunctional habits. The next energy session concentrated on healing Louie's nervous system by directing intentions of love straight to Louie's soul and by communicating to Louie's body, directing intense heat to his eyes, brain, stomach, spine, muscles and heart, as well; using the Direction Technique, helping Louie gain his confidence back to walk in the park and socialise with other dogs. We also helped Louie's owner to have effective dog training skills, so Louie can feel safe. Knowing he will feel tentative for the next 6 weeks. Watch how happy he is and never forget the response he had after the energy. She knew her role was not to neglect him as that was his past when he was not treated well by his past owners. People and dogs heal each other and by doing this, transfer conditions in each others energy systems. I watched as Louie's owner began to itch her skin. I knew this was a perfect time to teach Louie's mum how to communicate and heal her dog. I asked if she communicates with Louie and does he have any skin problems? She answered, "Since I had him he has skin allergies and I healed it with diet." I asked, "Would you like to learn how to heal Louie using energy, so your own skin and his skin heal?" I placed my hands on Louie's sensitive stomach that was hurt as he fell to the ground in the attack, then gently moved down his spine. During this time I noticed Louie's mother itch her arm, taking the pain and trauma out of Louie's skin condition. It shows that empathy can help heal both people and animals if done correctly. "He never had proper training and can be naughty." Moving my hands up his spine, I felt spasms in his muscles. Heat came through my hands to relax the muscles. That's when I knew this gift of using energy and heat, which is an ancient traditional skill, can be transferred to this beautiful owner who only loves Louie. We can heal our animals and we can heal ourselves. That is why the Direction Technique was developed, to give a direct pathway to wisdom and knowledge. At this critical stage of this energy healing, we needed answers, direction and strategies to remove any guilt from leaving Louie for too long and not to excessively worry. Louie's Mum learnt how to speak to Louie intuitively. I knew Louie wanted me to heal his owner. With this knowledge, Louie's Mum laughed, because all she wants is to heal him. I moved my burning palm from the stomach up towards the thyroid gland and transferred this ancient heat method, ancient knowledge for her to heal Louie. My hands became cold as the heat was transferred into Louie's mother's palm. Her hands warm and gifted with this energy she transferred it to Louie to heal him. The mother learnt the power of the Direction Technique. She became aware of the strong connection between her and her dog in return to help heal each other and communicate without words. We both set our minds for Louie to sit, and that is what he did. To help Louie's Mum to listen to her better, especially when she calls him. Using the Direction Technqiue we healed both heart, cleaned his ears, not be afraid and feel the calmness. Tracking Louie's body, body language and healing the energy around the word "LEAVE", we removed the feeling of guilt, healed deep trauma of the brain and emotions of past traumas. 3 Ways to Clean Out Your Energetic Clutter. In physics, a hologram is a three-dimensional image formed by the interference of light beams from a coherent light source, and holography is the study or production of holograms. Shamanic thinking incorporates many holographic concepts. The Hawaiian kahunas, believe that everything in the universe is infinitely interconnected and that this interconnectivity can be thought of as a giant web. In other words, the universe is itself a kind of giant hologram. "I had been experiencing an unexplained back and abdomen injury for 2 months before I went to see Katrina for a healing. I had tried a doctor (had X-rays), chiropractic, physio, and kinesiology, and although these practitioners were good, there was not much change in the injury. At that stage I was only able to be upright for about 3-4 hrs a day, and I had lost all hope and felt totally overwhelmed. When I went to see Katrina, she did an intuitive body scan and found a pinched nerve in my shoulder, within the first 10 mins of the session. Katrina then did a shamanic healing on this, and some of the pain eased immediately. We then worked on the emotional issues surrounding the injury, and the beliefs that I held, which were hindering my body from healing. After my session, I felt lighter and everything actually looked brighter. The distress had gone, I felt hope again, and hopeful for my future, and I was able to be upright again, for which I am very grateful." Autism has its own language. The autistic child may want the parent or educator to learn their language, which is language of thought and special awareness. This language may not be the same as the parents’ language. The Direction Technique introduces a new way of communicating for the parent to learn the child’s language, which is the autistic language. Autistic language is multidimensional, which explains why they need their own space. Each autistic child is different from another autistic child. In some cases a child will use the spoken language, while others will communicate through non- spoken language. Some autistic children seem to display genius behavior. They are on earth to bring new knowledge to the world. The autistic child may not like being in one place at one time. They develop what I refer to as multidimensional behaviour. Teleportation is a way of thinking in a multidimensional way, which allows you to reach these autistic children. Direction Technique uses teleportation skills and brings a new way of helping to communicate with autistic children. One tool that can help children of the autistic child is how to teleport to communicate with these special children who already know how to communicate beyond language. Autistic children like to be in their own hologram. A hologram is also a structured energy current. Everyday we live in a set of energy currents. A hologram is like going to another world. A characteristic of autistic children is they live in holograms in other dimensions. People might say realms. The autistic child goes to these realms and may stay there. The Direction Technique teaches a parent to go to these realms and understand their child, as well as allowing the child to come back to everyday life, by accessing the endocrine system. This technique brings awareness to the body and helps the children activate the endocrine system, which causes the glands to be aligned. An extension of the Direction Technique is Dolphin Energy Healing, where the dolphin’s skin connects to the autistic child. The dolphins make the children happy and through happiness children learn. The autistic child communicates with the dolphin. I have witnessed improvement in speech and awareness. The Direction Technique is a tool to help facilitate happiness connections. Swimming with the dolphin is an ultimate act to heal the child. Once the autistic child feels safe and others understand them and their unique way of learning, then they may not demand so much attention and they feel heard. This is a way for the child to feel loved. The child picks up the stress of those close by. It is imperative for the educator or parent to look for signs to change what they are doing and change it. This will fill the emotional void within the child and they then can communicate their needs. It is important to notice the signs early to prevent the onset of obsessive-compulsive behavior. Parents and educators may at times feel stressed or frustrated trying to help these children. They do love them. I feel so much compassion for those that help these children. If parents and educators can learn a different way to understand them, then they can develop effective teaching strategies, as well as ways to create quality time with their child. I have facilitated a healing on an autistic child when the parents took the dolphin course to learn how to understand autistic multidimensional language. The child improved in mathematics. I also construct individual learning programmes for children, special needs and adults so they can continue to be learn from with the dolphins in the future. The new children in the world are very good at being multidimensional, as they use the skill of teleporting in everyday life with modern technology. I have noticed some autistic children’s nervous systems become calm after either watching or being in the blue, green ocean. These children respond to change if they have your trust, feel safe, and learn new ways to make their energy field outside their body feel solid. If they can control their energy field around their body, then they can interact more easily with the world around them. the teleportation skill then we were able to communicate with his autistic son. John discovered how to visualize his son on his knee. He found that teleporting was an easy way to understand how to communicate with his son. I asked John what he wanted to tell his son. He replied, “Wake up, son.” The response was funny. I heard this message by using my teleportation skills with his son. John’s son said, “I am already awake. You wake up, Dad. I have the genius gene.” (We later discovered that the father might have had slight systems of repetitive behaviour as a child.) He suddenly released a lot of grief. I also told this man, “Don’t be surprised if another young energy is surrounding you and your wife.” One week later, John told me that his son spoke for the first time in four years and his wife just told him she was pregnant. After years of witnessing clients adapt, change and progress to move forward, I have discovered that these viruses in the world are present to help humankind evolve and survive helping to increase the strength of the immune system to adjust to the sudden rapid increase of changing climatic environments. Viruses have their own collective thought systems and they are intelligent. They have collective thought systems, just like the human thought systems. Therefore we need to learn how to communicate with the body, as well as the virus. Instead of thinking, “I want to get rid of the virus”. It may benefit you to think, “How is this virus helping me evolve”. This is forward thinking. To change your own perceptions and look at alternative ways to communicate in the world, and that means, to understand that training the intuitive sense of telepathy will guide you to be in the right place at the right time. Another explanation of telepathy is clairvoyance, extrasensory skills, and premonition or a sixth sense. However I think it goes beyond a 6th sense. I think we have more senses to acquire and we need to accomplish this now, so we then can predict a future. If we do this, then people will have insights on how to develop new ways of thinking, even scientifically to find ways to heal the planet, and our environment. What I have discovered after continually healing myself using the Direction Technique, that I communicate with the intelligence of the virus, “the collective thoughts systems of the virus” and these beliefs, conscious thoughts help me heal. I reference “Adapting to the future”, in the same context as, training your intuitive senses to facilitate “Visionary Skills”. In history, people used the term “Seer”, for people who had the ability of being a channel, psychic, medium or forecaster. It is time now for people to learn how to be there own “Seer” so they regain hope to live a fulfilling life. That is why in February I will be presenting the “Visionary” workshop, which concentrates on vibrating energy inside the pituitary gland. This gland needs to be stimulated not only for physical functional reasons, but to develop the ability to “see” the future. I will also help vibrate energy into the thymus gland, which helps the body build up its immune system. That is another reason why I developed, refined the simple “Direction Technique”. This teaches people to look into their own future. To learn to be their own “Visionary”, or “Seer.” Then they have the ability to use the neurons in their brain to take action and create a positive future. The next generation needs a future. What I have acknowledged is, it is important to reflect on the past, the present, change perceptions, but the Direction Technique teaches you tools to be objective, look at the past, present and future. The unique system, the “Direction Technique” trains your intuitive senses (psychic senses), balances your hormones and glands to prepare you for your future, meaning, and foresight. To train your neurons in your brain is the key to a successful future. To train your energy helps you notice that you can be control of your own destiny and create a future, so that you let go of past hurts, allow the correct energy to support you and you will find you will be in the right place at the right time. Say thank you to yourself for any struggles in your life and then change what is not working for you. Then say, thank you for the virus for slowing you down, to allow your brain, your neurons, your psychic senses, to adapt and make the changes to help you evolve. The benefits of being able to adapt to the new viruses are your immune system and glands, psychic ability evolve and you begin the process of learning the next intuitive sense – foresight. The benefits for the world to being able to adapt to the new viruses is, the human consciousness can wake up their intelligence and be aware of how energy affects peoples’ psychi, body functions and these evolved intelligent minds that are stable, will be able to feel compassion, therefore this intelligence will bring forth new technology to heal the planet. The world will understand that energy will heal our planet. The Direction Technique will help you adapt if you get the virus. It helps you be aware how the collective conscious beliefs of the world, especially in times of crisis affect individuals. For example throughout history, world wars, economic instability, collective thoughts of worry, despair, lack of financial independence, allows the human mind to weaken, the immune system to weaken, and then becomes a host for the intelligence of the collective beliefs of the virus. In my book, Focus for Direction-How to Self Heal and Find Your Own Answers, I have stated the collective beliefs that attract diseases, alongside showing the harmonic pathway of sound vibration that tracks the virus pathways in the body and heals the body. These viruses have certain sounds, and each virus sound is different. That is why I take people to communicate with the dolphins’ sound vibration and teach you to intuitively communicate to prepare their auditory senses, to self heal and enhance auditory senses for self healing. Within my book, I have documented case studies of how the Direction Technique healed a stomach, tinnitus, deafness all of which were caused by viruses, as well explaining what the sounds are of herpes, shingles, chicken pox, HIV/AIDs, influenza. However, the most important message I want to share to the world how the power of energy and harmonic sound vibrations can heal a body and the virus. Each of us has the power and ability already within us to create a positive life. When you add the new energy of Direction Technique you are able to channel your existing energy into a form that helps your neurons to function at a new level that allows for new thought positivity to vibrate in your cells and is transmitted throughout your body and brain to help you to regain hope and live a fulfilling life. To be able to adapt (meaning strengthening your immune system, being flexible and understanding the healing powers of energy) to the new strains of viruses in the world, a person needs to vibrate energy into their glands. These glands in the body, specifically, the pineal, pituitary, thymus, adrenals, pancreas and reproductive glands, then are prepared to adjust and regulate with efficiency. Then your body boosts your immunity so you are at a lower risk of feeling the effects of a virus, and if you do, you have activated your body's intelligence to fight the virus. Once your body, mind and body systems work in harmony, then you notice you have the ability to have heightened intuitive senses, which are essential for you to evolve, and expand your intuitive senses for your future. This is why I am writing about these ancient intuitive senses that have been maturing for centuries. It is imperative for the intuitive senses to advance, especially with the changes happening on the planet now. The changing gravity, or force of energy is affecting peoples’ feelings of being stable; therefore they are influenced by collective thoughts of the world. Your mind can be weakened when you start thinking like the collective, when it is negative. You become influenced by negative energy. A weakened mind can weaken your body. This also weakens your immune system and actually helps your body to attract a virus. Our “psychic senses” need to be activated, which helps the psychic senses of the glands to be activate, which allows the body to adapt to the new viruses in the world. The new way of energy healing - which uses your intuitive energy – which allows this to happen is called Direction Technique. By training energy, one can shift belief systems out of the collective conscious, and give a person a clear positive space to see clearly, lessen confusion, clean energy and give clarity. The more you change negative behaviours that weaken your thinking, the more you gain confidence and you show others who you are in a group. When you do this, you shift your negative perceptions about yourself, your environment and the world. The natural protective immunity boosts, strengthens and realigns a sense of self in a collective that could be quite damaging depending what the collective belief is. Negativity can make you vulnerable to disease and particularly a virus. Four years ago, I had clients for a whole year, display the same symptoms, persistent coughing, inability to eat and these symptoms lasted for months. Two years before this, I knew I was adapting, preparing my intuitive senses to develop to the new strains of viruses to help prepare my immune system. I was sick for nearly twelve months knowing I was preparing for my future. My immune system now works immediately, my thymus, pituitary, adrenal, pineal, pancreas, thyroid and reproductive glands work in harmony and I can adapt, change my perceptions, and know what beliefs to change. I am aware of the effects of energy and get better quicker, instead of taking months to adjust. If you train your energy, meaning dedicating your daily life with positive affirmations and develop a positive mind-set, your intuitive senses then work in alignment with your body and mind, creating clean energy in your body. Your brain develops neuronal pathways, which is essential to connect the nervous, endocrine and immune system bringing you not only a sense of peace, but feelings of positivity and good health. These intuitive senses have been lost over time and it's “now”, they need attention. They are the gut, hearing, feeling, knowing, sensing, and to note, the young generation are fully aware of the colors that heal you. These colors have been used by the ancient healers throughout history and each color is used for energy healing for emotional, physical and spiritual blockages. By training your intuitive senses, you develop another unique intuitive skill and that is having the ability to use sound vibration to heal cells in the body. By directing harmonic sounds into your body and learning to direct sound into parts of the body that are weakened, cells then have energy fields that accept healing. Once you begin to focus on training energy, then the ancient healing vibrations are shown to you. You will understand how heat, if directed properly can heal cells, you will be shown the ancient healing methods of transferring matter, or illness out of the body and placing this dense energy into a more solid form, i.e., rock or ice. It is essential to heal the cells of past trauma, prolonged grief, so you can adapt, change and notice how intuitive you have become. How Does the Direction Technique Help? What I do is tap into the body's natural ability to strengthen itself by using this new intuitive energy healing called the Direction Technique. This technique allows you to strengthen your sense of self, your mind and body through positive thoughts and beliefs about yourself, people and the world. This technique using the extraordinary natural power of your body to tap into your intuition, but also it reveals the natural way to tap into the intuitive energy that is stored in each of your body's glands. By activating this intuitive energy throughout your body, you elevate your energy to a higher and lighter frequency which allows the body the chance to create natural healthy ways to heal. The immune system is strengthened over time with this new intuitive energy, and in the process weakens the impact of the virus and disease in your body. That is why I developed the Direction Technique.